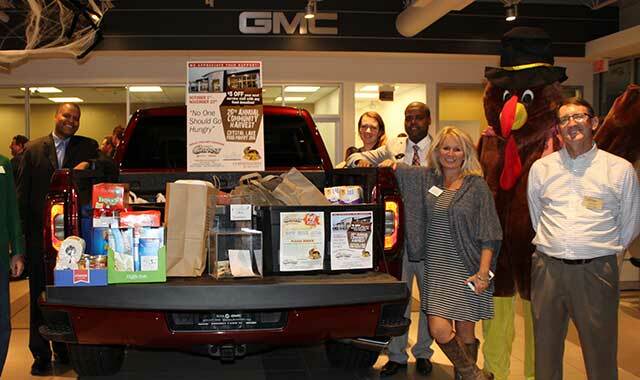 Some of the results of last year’s Courtesy Buick GMC Kickoff to Community Harvest Mixer. Left to Right: Ray Fregia Jr., Vanessa Baker, Rik Fregia, Judy Pelinski and Bill Eich. Giving empowers.A profound thought crossed my mind as I started writing today. I wondered who might have penned these words of wisdom. After all, they make sense. By giving to others, you gain power. Think about it. Give another a helping hand and you suddenly feel like a better person. If you get a “thank you” or smile of gratitude, your confidence grows. You’re empowered by helping another. Whether it’s “paying it forward” in the coffee shop line or making a significant contribution to hurricane relief, you feel stronger when you assist others. You get, in many cases, more than you give. How does it work? Giving to others fuels the engine of reciprocity. That good feeling of the recipient often triggers more giving. Good energy builds more good energy. You give to one, they give to another and soon we’re all better. Giving makes connections. Both the giver and the recipient become more aware of needs and resources. In the best situations, new solutions may result. Also, your giving may introduce you to others who give and seek to collaborate. Giving educates and informs. Ready to help? Look around at the places that need help and pick what suits your talents or pocketbook. You’ll learn much about the world around you in the vetting process. In some cases (like my Habitat for Humanity Build Day), you may learn how to use a hammer. You will also learn that giving time and talent can be as valuable as dollars. Giving mentors others. You give of your talent or dollars and another person or company recognizes that solutions could fit their situation. Sponsoring or gifting a charity in your name or through your business can help others to learn that they, too, can make a difference. Giving expands the scope of hope. We all have something to give. Like the drummer boy at Christmas, the smallest gift can have a huge impact because it is so valued. Give hope to another through sharing your gifts, talents, resources, etc. Giving at the holidays can be in gratitude of a profitable year, appreciation of clients, tax abatement, or just because you desire to make the world better. You and your business will benefit from giving at every turn. You can create your own program or align your company with service groups, chambers of commerce, community foundations or other networks to collaborate and make the gift greater. One successful example of community/business giving is the Crystal Lake Community Harvest coordinated each Thanksgiving by the Crystal Lake Chamber of Commerce. For the past 27 years, the chamber has led members and the community in an ever-expanding goal for food collection and fund collection. The experience culminates with thousands of people coming together Thanksgiving morning. Led by volunteers and guided by Chamber president Mary Margaret Maule, the Community Harvest this year aims to collect more than 85,000 pounds of food and $50,000. The results will stock the Crystal Lake Food Pantry’s shelves throughout the year. Working together for the betterment of those in need in your community creates goodwill, relationships and empowerment. Your community and chamber may have a similar collaborative giving opportunity. Discover the unique needs that you and your business may serve. Inspire your employees to work together to make positive change. Consider documenting the results on social media to share with other business leaders and expand giving with your example. Try giving, and get back a powerful result! This entry was posted on Friday, November 3rd, 2017 at 11:57 am	and is filed under Northwest Business Magazine. You can follow any responses to this entry through the RSS 2.0 feed. Both comments and pings are currently closed.